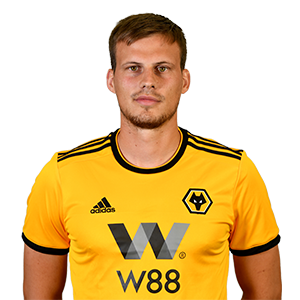 Ryan Bennett was a rock at the back in Wolves’ Championship-winning season, in what was his first campaign at Molineux. The defender played 33 times in gold and black last season, claiming a dramatic win against Bristol City with his only goal. The former England-Under-21 international arrived at Molineux on the back of 119 appearances for Norwich. Bennett made learnt his trade at Grimsby Town and developed further during two seasons at Peterborough United. The defender joined Norwich for £3.2million in January 2012 and remained at Carrow Road until the Molineux move. Back in the Premier League, Bennett netted his first top-flight goal for Wolves with a towering header against Leicester City.